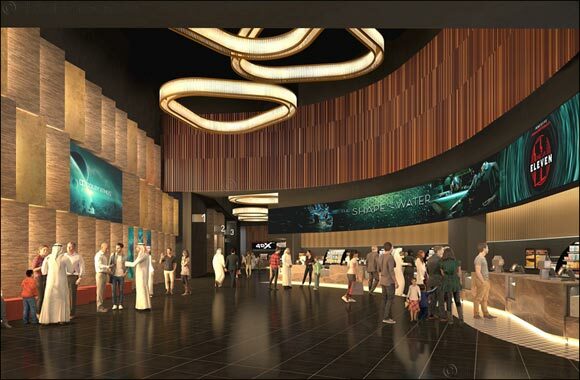 Kuwait, 27 May 2018: Kuwait National Cinema Company (KNCC), the leading entertainment company in Kuwait, has announced that its “Cinescape Al Kout Mall” will open its doors to visitors during the third quarter of 2018. The introduction of Cinescape in “Al Kout Mall” is a rich addition to the diverse range of entertainment offerings at Kuwait’s largest shopping and entertainment destination in the South of Kuwait. Recently welcomed visitors, “AL Kout Mall” is the ultimate destination for shoppers, tourists and thrill-seekers from Kuwait and the region. Homing nine of the 12 screens operated by KNCC in “Al Kout” project, “Cinescape Al Kout Mall” with its high-end design offers the most advanced cinematic and innovative entertainment experience, equipped with cutting-edge laser screens and state-of-the-art audiovisual technology. The nine screens provide a total capacity of 1,542 seats including the latest offering of Premium seats that are designed to deliver ultimate comfort and luxury. KNCC has also leveraged the most developed cinematic technology at “Cinescape Al Kout Mall” including the first IMAX Laser in Kuwait and the unforgettable experience of 4DX. In an effort to provide a faster, smoother and easier customer service experience, 14 points of sale and seven automatic payment kiosks will be strategically placed within the venue. For the first time in Kuwait, “Cinescape Al Kout Mall” will introduce a service that allows visitors to pre-order their food and beverages online to avoid queuing, while ensuring a unique entertainment experience. Mr. Khaled Al Marzouq, Business Development Manager at KNCC said: 'The number of our cinema audience is growing which confirms that, even with competition from other companies, we continue to set the benchmark for raising the level of services and experiences offered to the Kuwaiti community.” He added: 'We constantly strive to introduce the latest offering to the Kuwaiti market, therefore we are eager to develop “Cinescape Al Kout Mall” to offer our visitors a truly unique entertainment experience with the best technology and design”. KNCC aims to cater to all cinema viewers while adhering to Kuwait’s customs and traditions in selecting its movies. The company stays ahead of the film entertainment industry through its various cinemas, selected film packages and continuity in providing the best technology and services to its visitors. KNCC has recently signed an agreement with Salhia Real Estate Company, to operate cinemas in Salhia’s Assima Project that will constitute a major urban architectural move within Kuwait City. The company will invest in this site to exceed the expectations of its customers in terms of diverse designs and level of services and technology. In addition, KNCC, through its various projects that are still under construction and implementation, is seeking to expand its operations with new venues to reach the largest number of visitors in Kuwait.